© 1988 by Sony Music Artists Inc.
Q: Is there a manga adaptation? 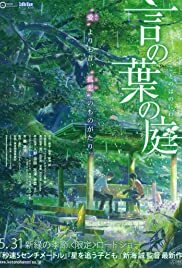 Promoted as a feature-length film, Shinkai Makoto's Garden of Words surprisingly only lasts 46 minutes. However, it was enough for the director to portray human emotions as well as understand the purpose of relationships. The word "love" in modern Japanese is "ai", but in the ancient language, it was actually written as "koi", which is a compound of two other Kanji means "solitude" and "sad". Though Garden of Words is set in modern times, "love" in this film will be portrayed in its original meaning, which leads to a story about longing and loneliness, as well as suggesting an unhappy ending for love. At the center, there is Takao, a 15-year-old student who wants to become a shoe-maker. On rainy days, he often plays truant in a Japanese-style garden and learns to make shoes there. By chance he meets Yukino, a mysterious woman much older than him, and whenever it rains, the two of them meet each other in the garden. Over time, their relationship deepens and the mystery surrounding Yukino finally reveals itself on a dry day. 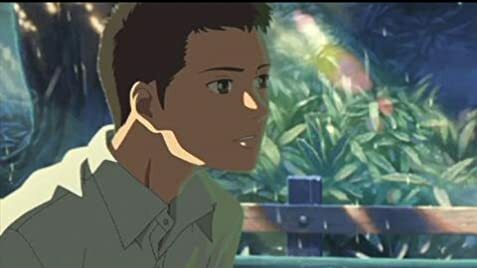 Similar to Shnkai's previous films The Place Promised in Our Early Days, 5 Centimeters Per Second, Children Who Chase Lost Voices, the most impressive thing about Garden of Words are the vibrant & unique visual elements. In this latest film, he continues to develop his own unique style. Clean and cute, a little bit cheesy even, Shinkai uses excessive glare and light pink tones, and the result is a bombastic impressive 46- minute picture. The park's natural setting, with green trees drooping into the water, the wind stirring the small rocks, creates a space ripe with romance and poetry, which helps ease anxiety. Although the scenes in the school, Yukino's house, train station etc were beautifully drawn, the brightest points in the painting of Garden of Words are the natural moments when two people sit in the park together and enjoy the stillness of emotion. Garden of Words delivers a simple, soft love story, though many would argue that it is taboo. The director knows how to manipulate love, make it as natural as rain, by arranging the meeting at a far away location from where they work/study, only meeting on rainy days to make their feelings vibrate. Eventually, when the truth of their fate is revealed, the audience completely accepts it, because their love for each other is full of sincerity and cultivated diligently through the rainy days. Garden of Words is a triumph of visual style over substance. It can be very predictable, can be very cheesy when two people are hugging and crying at the end. But the movie creates honest and fresh emotions, accompanied by an impressive visual expression. Garden of Words is not simply the binding of the last two people through some lines of Japanese poetry that they read to each other, It is also the shining of unique storytelling style with images. And with the blink of an eye, a small gesture is enough to say everything about human emotion, words probably are not needed anymore. Garden of Words gives you a unique experience, exploring the visual and aesthetic language of love. 29 of 33 people found this review helpful. Was this review helpful to you?